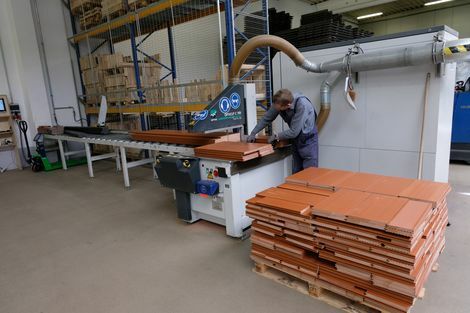 The planks of megawood® are cut by the employees in the factory. Holger Sasse, Managing Director of NOVO-TECH GmbH & Co.KG, is following a well-tried principle with a new approach, with his 142 employees at the company headquarters in Aschersleben in Saxony-Anhalt: products made from a composite of natural fibres with polymers. Around the world, other companies are already producing under the name WPC (wood plastic composite). Holger Sasse does not want his material to be compared with WPC liquid wood, however, a 50:50 mixture of natural fibres and plastic constituents. The result can hardly be called a natural product, he says. He regards WPC as being more of a fibre-reinforced plastic. The product of megawood® by contrast consists of at least 70 percent natural fibres, which come 100 percent from shavings from the wood industry. They contain no more than 30 percent polymers and additives. With this, a completely new group of materials was created: wood polymer materials. Thanks to megawood® the term has been defined and standardised. In the foreseeable future, it will also become calculable and be approved in construction with an elasticity module. This has been made possible by cooperation with the Fraunhofer Institut. This assessment and calculability of a material is important for ensuring that it can also be used for load-bearing components. Another market for this versatile material. The success story of megawood® began in 2005 when it was still at a site in Halle Ammendorf. But Holger Sasse returned to his roots and relocated the company headquarters to his home town Aschersleben. The foundation stone was laid on 09.02.2007, and the first board was produced in August 2007. Despite having capital resources, the young company required public funding. The Managing Director is still very grateful to the state of Saxony-Anhalt for this support. And for cooperation with the investment bank, without which it “would have been substantially more difficult than it was and would not be the way it is today”. In the framework of this principle, NOVO-TECH takes back old plank flooring in order to re-process and re-use them. Holger Sasse mentions with a wink that not many of its products have been returned. The company has only been in the market for twelve years, and it is assumed that the material will do its job outdoors for 20 to 30 years. These figures are confirmed by the company’s own stock of twelve-year-old outdoor installations and 97 years of artificial weathering in the laboratory - wood cannot compete as a material in this respect. NOVO-TECH now no longer produces just the well-known barefoot planks, but instead also has privacy shields, light systems and garden torches in its range. The raw material is also marketed to customers as granulate. The company’s warehouses contain an extremely wide variety of items in all variations for megawood® 350. Holger Sasse proudly relates how even large DIY chains approach him to commission decking boards from the natural material for their own brands. Virtually anything that the customer wants can be manufactured from the wooden composite material: garden furniture, benches, flower tubs, kennels and even whole children’s playground sets. TÜV (control board) certification ensures that the products and/or the material are also suitable for children and can even be used as toys. The TÜV was also astonished at the material’s long service life in its repetition test: Two years after the first inspection, the test playground still looks like it did on the first day. Ideal for ensuring that many more generations of children can also have fun on it.